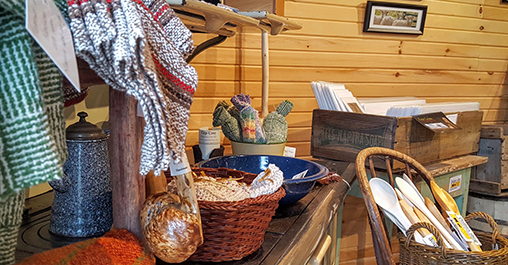 In May 2016 Ross Farm Museum in New Ross, NS welcomed the public to our new Learning Centre, built to enhance the Living Heritage Farm Museum visitor experience with gallery exhibitions, workshops, open hearth and traditional cooking classes, and boutique retail The Pedlar’s Shop. We are looking for hand-crafted, artisan quality work for commissioned sale to our 25,000 visitors each year and counting, from home and away. Artisan submissions will be received three times this year, selected through a curatorial juried process, and if selected, presented for sale in The Pedlar’s Shop, open year round. It is our hope that you have what we’re looking for: work that you have poured your heart and soul into with your hands and is ready to share with the world. From sheep to shawl, ash to glass, grapes to wine, we want to know what you’re making. Ross Farm: We’re so old we’re new again.